Touring community arts centers in Woodlawn. On a recent Monday morning, this curious coupling of Kulikauskas’s childlike art—made from ribbons of plastic vinyl, cardboard, and markers—and the SSCAC’s dignified bearing forms the backdrop for the Woodlawn/SHoP workshop. The series is cosponsored by the Graham School and the Civic Knowledge Project, the Humanities Division’s community outreach arm. After a monthlong survey of the South Side’s ecosystem of community and art centers, the workshop’s curator, artist John Preus, MFA’05, is taking his class into the field for another six weeks to better understand Woodlawn’s history and power dynamics. Kulikauskas is showing his exhibit to his classmates as a concrete example of how art inhabits space, and how artists interact with organizers. The rest of the class members are similarly active on the South Side, as organizers and artists. Laura Shaeffer is Preus’s partner at the Southside Hub of Production (SHoP), which has been using Fenn House, an 1890s mansion on Woodlawn Avenue, as a center for social and artistic programming since 2011. Grace and Nia are Graham School students looking to better understand arts organizing; Grace says she’s more interested in the “business end of things,” while Nia, a writer, says she’s learning more through the class about Woodlawn’s art scene than she has as a frequent volunteer and participant. So here we are: real-world U, week three. Preus has scheduled us a tour at the Swift Mansion—formerly a dowry, a morgue, and a political headquarters, and now a transition house—and then it’s off to the nearby SSCAC. The class is intimate, casual, and even improvised: Danielle, who takes us in and around the Swift Mansion, comes along impromptu to the SSCAC; two other organizers passing through latch on to the group; car rides are offered freely; and everybody seems to have met, collaborated with, or heard about everyone else. 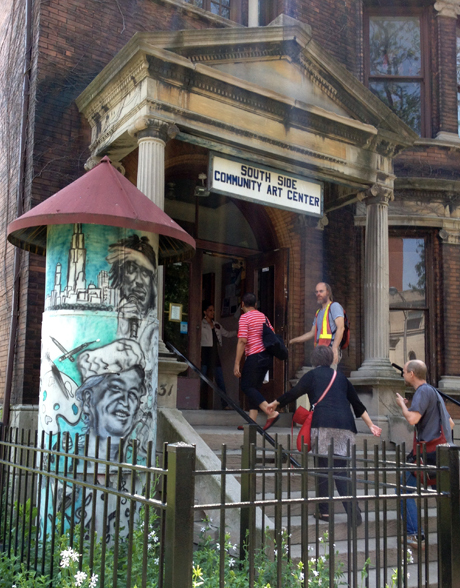 The SSCAC, though, isn’t the only mouthpiece for the South Side’s community members and artists. In past weeks, the group has visited Experimental Station and the Woodlawn Collaborative, each of which go about encouraging artists in their own way.